Superior beauty, comfort and softness are the keywords for this Classic Light GTX style. For those of you who already wear ECCO's, you won't learn anything new in this review. For those who don't, listen up. I've worn everything. Everything. And now the ONLY brand of shoes in my closet is ECCO. 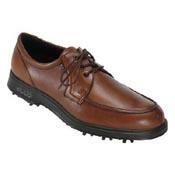 15 pairs of dress/casual/athletic shoes, 3 pairs of golf shoes, including a pair of these Ecco Classic Apron GTX's. The reasons... peerless comfort, extraordinary durability, simple good looks. If you haven't tried them, don't let a high price tag hold you back. These shoes will reward you tenfold. And don't be fooled by the so-called "athletic" look of other brands. These "street-style" shoes are the kings of comfort, all round long. Never had to try them out.